Hi there! My name is Angie Macdonald and I am a writer living in London. I love writing and I am passionate about health, wellbeing, nutrition and personal development. Write Health is where I write about all the things that fascinate me about health. I hope that in sharing my passion with you, you can learn more about how to nurture your own health and wellbeing. Write Health is also the place where I chart my own journey, through bad health and good, and share my self-discoveries with you along the way. I have spent years studying nutrition and personal development and am the proud recipient of an ITEC Diploma in Nutrition and Diet (Distinction) as well as being a qualified Life Coach with several years experience. 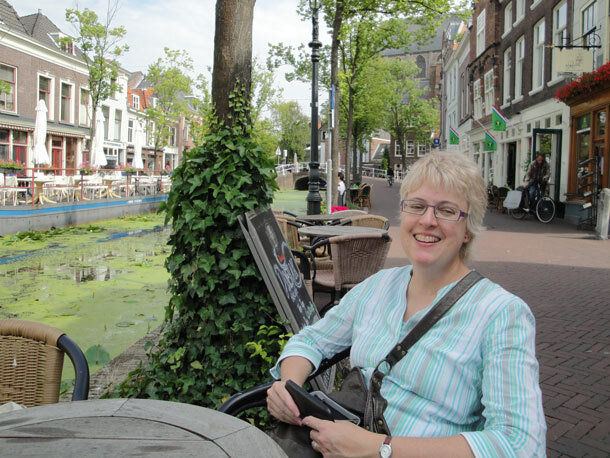 The photo of me above was taken in Delft, The Netherlands, one of my favourite places. I love the canals and the fact that most people ride bicycles. When I’m not writing about health, I can be found in my garden, reading memoirs, walking in the park or dreaming about the sea. I also love music and solitude.